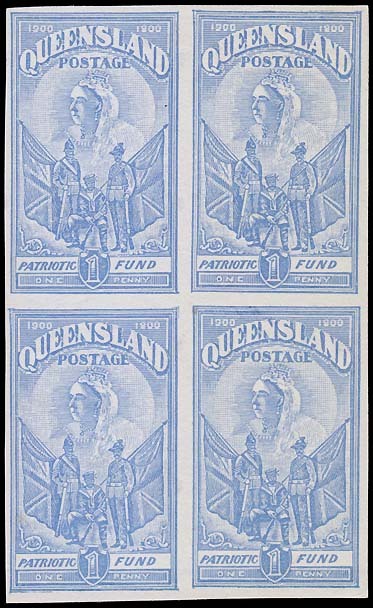 The 1900 Patriotic Fund issue of Queensland - the plate proofs/colour trials. Plate Proofs and Colour trials and were printed for both stamps. All colour trials were made with the final design and were therefore taken from the printing plate. The trials therefore also served as plate proofs. The 1d (6d) was printed in 11 colours but the 2d (1/-) was printed in just the single shade. No reason is known as to why so many variations were produced for the 1d (6d) value. 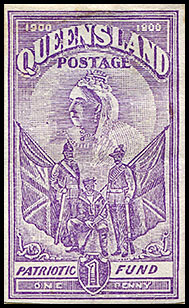 Prestige Philately estimates that 1d to 2d proofs exist in a ratio of about 100:1. 2d (1/-) proofs/colour trials presentation. 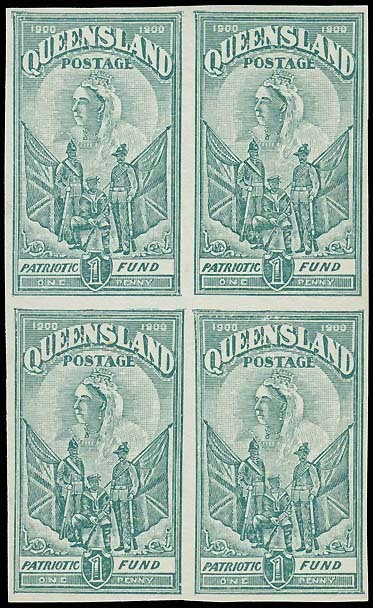 Eleven colour trials in different colours and shades were printed. 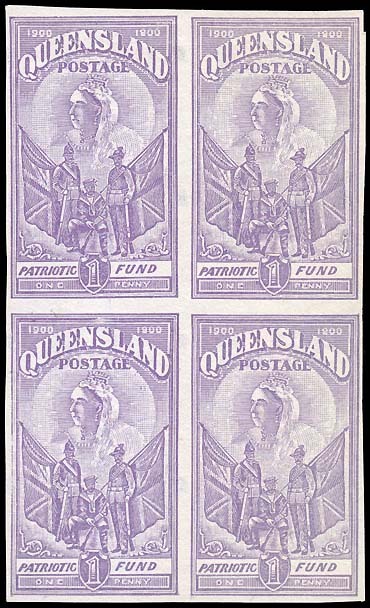 All were printed on ungummed watermarked paper and left imperforate. 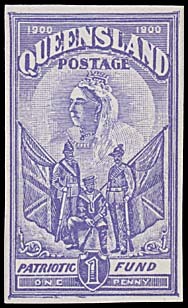 The watermark was the same as for the issued stamp - Q over Crown sideways (rotated clockwise). There are few complete sets known. 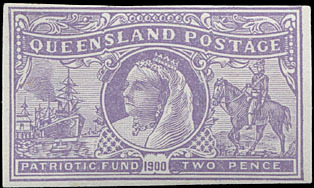 One is in the Royal Collection while another is in the Australia Post Archival Collection. The Presentation Sheet included elsewhere is a third example of a complete set. There are probably less than than five other complete sets - all of single images. 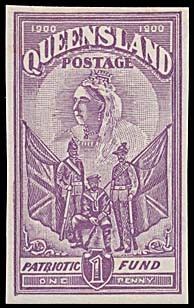 Singles are scarce and those which do come on the market tend to be in a narrow range of colours. 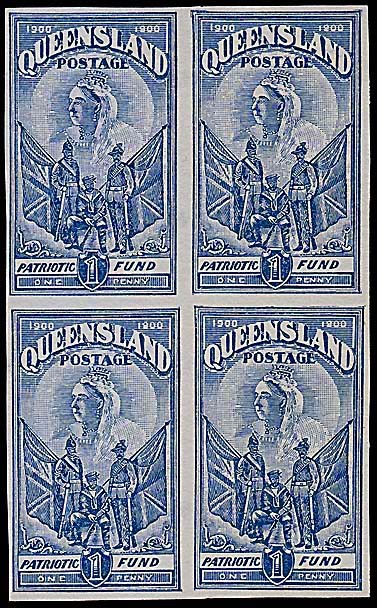 All blocks of four shown below have provenance of Alan Griffiths (Spink October 2012 Lot 1392). 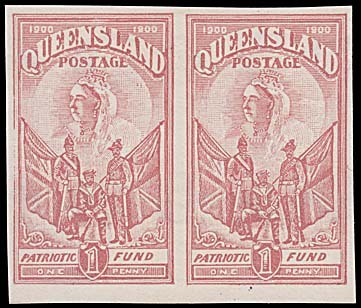 Dull rose-pink - rare multiple. 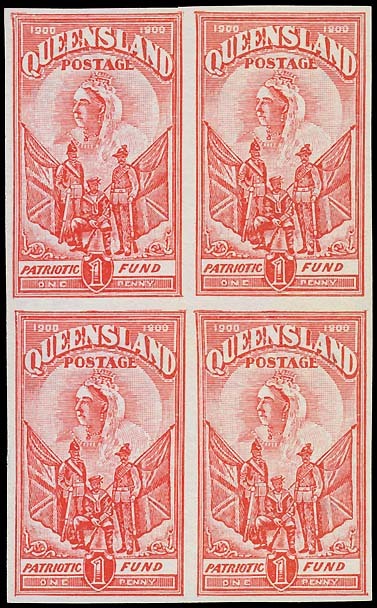 Prestige Philately December 2009 Lot 403. Apple-green (pale yellowish green) block of 4. 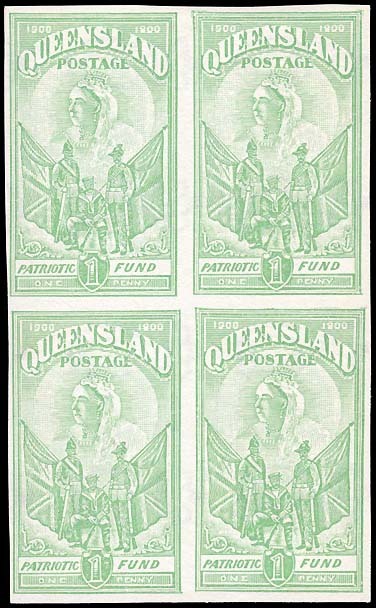 Emerald block of 4. Dark blue block of 4. "Colour and design approved for 1d.". There are perhaps five examples of the 2d (1/-) colour trials recorded. 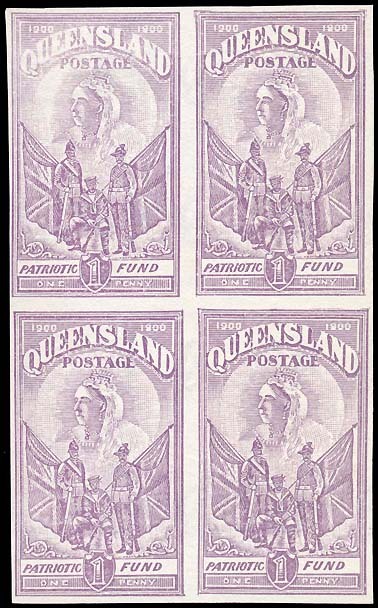 They were printed in bright reddish-violet. 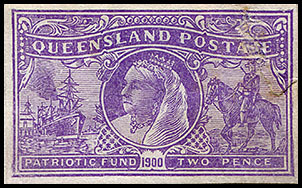 The watermark was the same as for the issued stamp - Q over Crown upright. This feature distinguishes the colour trial from the proof (which is on a thicker card with no watermark). Four of the five known examples are shown below. Wide right margin and good finish to top right corner. Rough border for lower half of right frame. 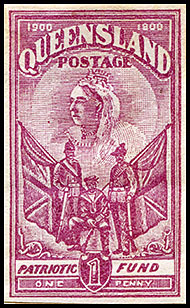 Prestige Philately June 2009 Lot 1210. David Feldman May 2014 Lot 41567. 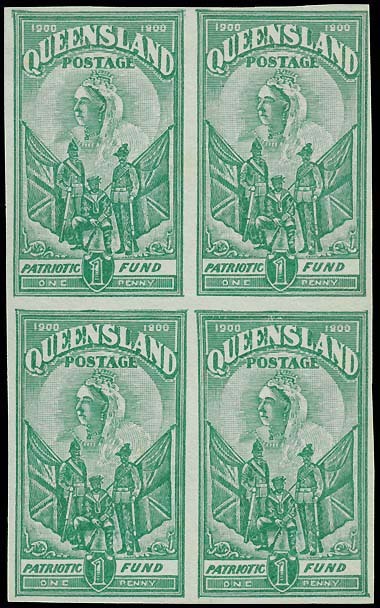 Has surface abrasions in the top right corner and a small crease in the top of the paper at the margin - almost certainly at the time of the printing. Affixed to the Presentation Sheet. Corinphila Besaçon Sale, May 2018, Lot 3195. 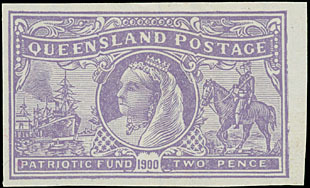 (Millennium Auctions, April 2003 Lot 588). No multiples of the 2d (1/-) colour trials are recorded.